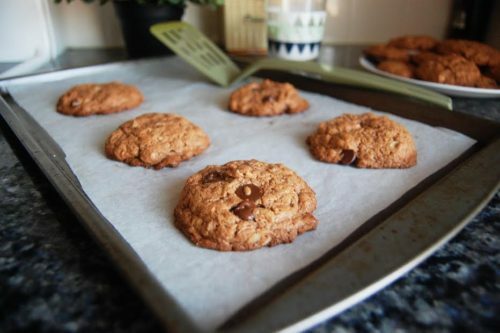 Penn Appétit – Chocolate Chip Almond Butter Oatmeal Cookies! The adjustment from baking at home to baking at school was a tough one. Back home I could always guarantee that if I came across a mouthwatering recipe on Pinterest and suddenly caught the baking bug, my mom would already have all the ingredients stocked in our cabinets. I never had to think twice about whether or not we’d have brown sugar or enough eggs for a recipe. My love of baking has been put on the back burner since I started college. I quickly realized that it’s hard to keep a fully stocked baking pantry and still have the grocery budget to buy other food. I didn’t want to give up baking at school entirely, so I found a solution: instead of seeking out something to bake based off what I’m craving, I let what ingredients are already in my pantry decide what I’m going to make. Whenever I catch the baking bug I look in my cabinets, assess what ingredients I have and look up a recipe online, minimizing the costs of going to the grocery store. If I’m low on flour I’ll look for flourless or gluten-free recipes, if I don’t have milk I’ll Google vegan/dairy-free treats to make. Most recently I looked in my pantry and found that I have a lot of almond butter- 3 whole unopened jars worth of it. Being more of a crunchy PB girl myself, it could take me years to use up that supply. Unless, I use it in a recipe! 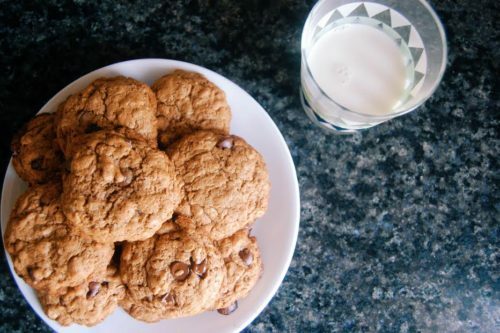 I immediately started searching for recipes that require almond butter (procrastinating all of my homework in the process) and found a recipe for flourless oatmeal almond butter chocolate chip cookies. Try saying that 10 times fast. It uses a full cup of almond butter and they’re so delicious no one would ever guess that they’re gluten-free.